According to a recent publication, by 2100 Belize’s population is projected to reach 1 million, but at the same time, substantial portions of the country could be under water due to sea level rise, exacerbating demand for natural resources. Global warming is said to be the culprit, and the novel energy financing is intended to help scale back some of its effects. In March, research published by the Nature journal and featured in the Washington Post indicates that sea levels are rising twice as fast as had been previously estimated, and the projection says that it will rise more than 6 feet by the end of the century. An online model shows that over time Belize gradually disappears under rising water levels over the centuries, with the last refuge being the Maya Mountain Massif in Central Belize—where the highest lands are located. 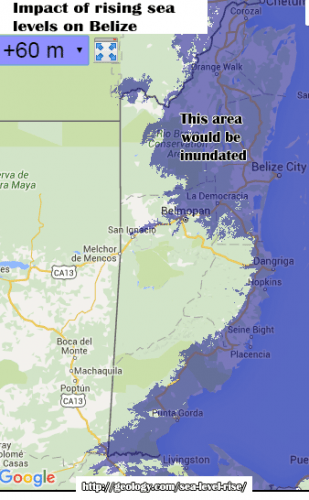 Belize appears to be one of the most vulnerable Central American countries to sea level rise. Amandala spoke with Dr. Kenrick Leslie, Executive Director of the Caribbean Community Climate Change Centre (CCCCC), a CARICOM agency based in Belize, who explained that most of Central America is much more mountainous than Belize, which has a very flat coastline with much of its land mass in the north and coast being at or slightly below sea level. As a consequence, sea level rise would impact Belize much more than places like Honduras, Nicaragua and Costa Rica. “The entire northern half of Belize and the entire coastal area all the way down to PG would also be under water,” Leslie said, pointing to the not too distant future. Dr. Leslie told us that currently, the sea is rising about 3 millimeters (mm) per year. “That might sound very small, but 3 millimeters in a year, in 10 years that’s 30 millimeters,” said Leslie. He explained that every millimeter rise, translates to a meter of land being submerged. This, he noted, could have implications for places such as airports, as well as infrastructure on the cayes. “So by the end of this century, you would have quite a bit of rise and coastal areas would be well under water,” said Leslie. This could have serious implications for the country’s water supply, he said. Inland waters would become more saline. He noted that currently, the national water network feeds from Mile 16 in the Belize River area, but the network would have to find a source point far more inland. Leslie said that the rate he quoted does not take into account the doubling recently reported in the Washington Post and Nature articles. By the end of the century, most of Belize City would be under water; and that does not take into account the tides or a storm surge, he added. “There are other factors that would make the matter much more complicated. All our offshore cayes, all those cayes at best are 3 feet above sea level; if you go up a foot of water, all the infrastructure would be severely impacted, including all the hotels,” he said. “In terms of municipal airports; that would be under water…” Leslie told us. “Placencia would be under water,” he added. The problem is that as a country, Belize has no control over sea level and the phenomenon that is driving it. According to the researchers who recently doubled the estimates for sea level rise, the ice caps in Antarctica are melting faster than had been thought due to high levels of greenhouse gas emissions. “We are in 2016, but in 2025, the water would have come up at least 3 more inches; and by 2050, which is not too far away and assuming the same 3mm rise per year (we are talking another 34 years), that would be affecting almost the whole of Belize City already – even at the current rate – and most of our cayes,” Leslie told us. Other Caribbean countries, even those that are more mountainous than Belize, are also vulnerable, because of their size and the location of key national assets, such as their airports. In Jamaica, two of their international airports are along the coast. The cost to the economy of countries in our region could be huge, but awareness of the future impacts of climate change and sea level rise on our region could help countries prepare for the changes that lie ahead, such as retrofitting infrastructure. Leslie indicated that the Green Climate Fund is just coming online and countries have to make sure that they submit proposals for financing efforts to build resilience to climate change. “The onus is on the countries like Belize to start to understand how to write projects that can be funded under the Green Climate Fund,” Leslie said. He told us that the Climate Change Centre is the only centre in our region, and one of the few in the world, accredited by the Green Climate Fund as an implementing entity. The Center can access (on behalf of CARICOM countries) monies for projects that can address climate change, in the range of US$10 million to US$50 million. “The countries have to be proactive. We can submit on their behalf but they have to take the initiative,” he said. Currently the Centre is working along with Belize on renewable energy projects that would cut cost, Leslie informed. All CARICOM countries, including Belize, recently signed the Paris Agreement at the special ceremony held in the US in April. The agreement is aimed at checking global warming and consequently containing sea level rise; but there are doubts as to whether the target set in the agreement can be met. Fletcher said that while countries have committed to “intended nationally determined contributions (INDCs),” the aggregate effect, even with those in place, suggests a 2.7 degree rise in temperature by end of the century. Dr. Leslie notes that the Paris Agreement only kicks in after a minimum number of countries ratify it—and those countries must include key ones such as the USA and China. Back in Belize, where the country’s vulnerability to climate change and sea level rise is little understood, there is also the need to address the problem of deforestation, which could exacerbate the situation on the ground. According to Jaume Ruscalleda, Sustainable Land Use Officer at Ya’axché Conservation Trust, since Independence, Belize’s forest cover has declined from 74% to 60%, and by the end of the century, the country will only have 26% forest cover, mostly in the Maya Mountain range—which, we note, is incidentally the last refuge from sea level rise. Ruscalleda cited maps shared by Emil Cherrington, a Belizean who does remote monitoring of Belize’s forest cover and by the University of Belize, which also documents the disappearance of the country’s forest cover. Dr. Leslie urges “proper land use planning,” adding that this should have been done with or without climate change. “It comes back to the border problem. There are a lot of the prime areas which have been designated by our country which are not to be used for clearing and agriculture, but [Guatemalans] are coming across the border and doing just that. 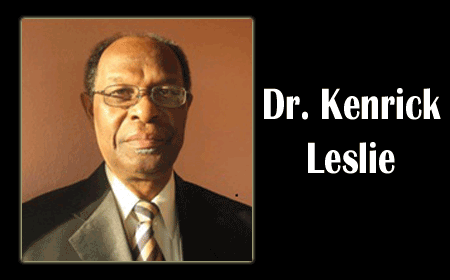 This should be addressed,” Leslie urged. By caribbeanclimate in 5Cs in the News on June 10, 2016 .